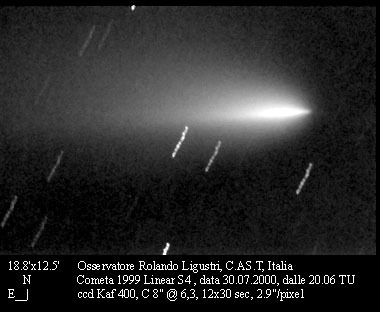 Observations of individual comets are given below in ICQ format. 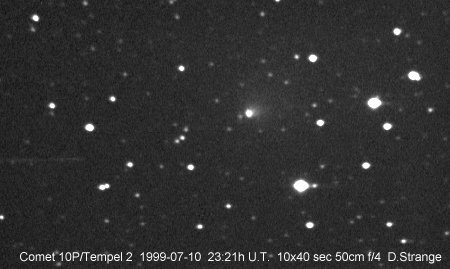 Comet 10P/Tempel 2 , makes its 20th observed return since its discovery by William Tempel (Milan, Italy) as a 9th magnitude object in 1873. Several unfavourable returns were missed in the earlier years. The orbit is very stable, which is one reason why it is a favoured target for planned spacecraft missions. 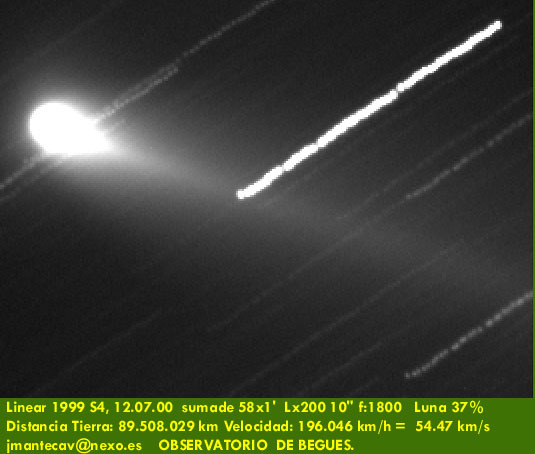 In 1983 the IRAS satellite detected an extensive dust trail behind the comet. Traditionally the light curve is regarded as highly asymmetric with a late turn on. There is a rapid rise in brightness as perihelion approaches, which continues more slowly for a couple more weeks after perihelion, followed by a slow decline until activity switches off. An alternative view is that the light curve is linear with a peak about a month after perihelion, which at this return occurs in early September. With a 5.5 year period alternate returns are favourable and this is one of them. It is closest to the Earth in July (0.65 AU) when it could be 9th magnitude and UK observers should be able to follow it until August, but it then moves too far south. More southerly observers may be able to observe it until the end of the year as it fades. The comet is now around 9th mag, having brightened rapidly in the past few days. 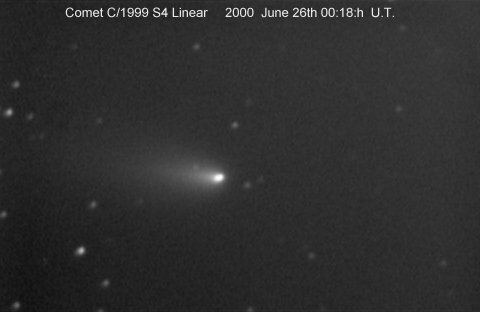 David Strange obtained an image of the comet on July 10. Jose Carvajal estimated it at 10.6 in 32cm L on August 5.9, but I was unable to see it with 20cm R on the same night. On Aug 10.9 Andrew Pearce and I observed it with 14x100B from just outside Penzance, Cornwall, my estimate was 8.7 (HS) and Andrew made it a little fainter. Back in Cambridge it was a very difficult object in the 0.20-m refractor, though it was observed during the IWCA. Andrew Pearce now back in Australia reports that the comet has faded to near 10th mag at the end of August. It is fading very slowly and it was still 12th mag in December. Observations in ICQ format , last observation 1999 November 8, updated 1999 December 15. Comet 21P/Giacobini-Zinner, the parent comet of the October Draconid meteors, will still be visible at the beginning of the year in Cetus and Eridanus as it fades from 10th magnitude. It fades quite rapidly and will be lost by the end of February. It is not well placed for observation from the UK, but will be visible from further south. 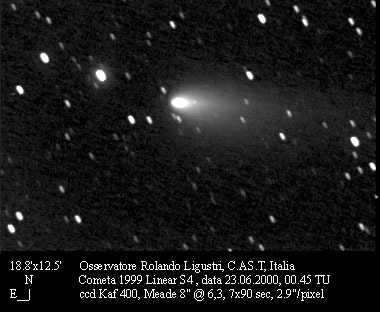 The comet was first discovered by Michael Giacobini at Nice observatory in December 1900 and was thought to have a period of 6.8 years. The next two returns were expected to be difficult to observe, but in October 1913, Ernst Zinner, of Bamberg, Germany, discovered a comet whilst observing variable stars in Scutum. This turned out to be the same comet, but the period had been incorrectly determined. The comet was missed at three unfavourable returns, so this was the thirteenth apparition of the comet. The comet is no longer visible. Martin Mobberley imaged the comet on October 14 and October 25 . Observations in ICQ format , last observation 1999 April 29, updated 1999 July 7. Comet 29P/Schwassmann-Wachmann 1 is not well placed for observation from the UK, but may be seen from locations further south. Andrew Pearce discovered it in outburst on March 31. It was well condensed and so relatively easy to see, but faded below 14th mag. Reports suggest another outburst to around 13th magnitude in early June. Jose Aguiar has reported it in outburst once again at the beginning of July. This annual comet has frequent outbursts and over the past couple of years seems to be more often active than not, though it rarely gets brighter than 12m. It is possible that its pattern of behaviour is changing. In the first half of 1998 it was in outburst on several occasions. The randomly spaced outbursts may be due to a thermal heat wave propagating into the nucleus and triggering sublimation of CO inside the comet. This comet is an ideal target for those equipped with CCDs and it should be observed at every opportunity. The comet is just past opposition on the borders of Hydra and Libra. It is in solar conjunction in November, passing into Scorpius. Unfortunately opportunities for UK observers may be limited as its altitude does not exceed 15 degrees from this country. Observations in ICQ format , last observation 1999 July 1, updated 1999 August 12. Comet 37P/Forbes is no longer visible. Observations in ICQ format , last observation 1999 October 10, updated 1999 October 31. Comet 52P/Harrington-Abell was found in outburst at 12th mag by Alain Maury, Observatoire de la Cote d'Azur, on CCD images taken on July 21.1 UT when its predicted magnitude was about 21. [IAUC 6975, 1998 July 25]. The comet reached perihelion and opposition in late January. This is the seventh observed return of the comet since its discovery in 1954 and it has never became brighter than 17th magnitude at previous returns. Normally it would not be expected to get brighter than 15th magnitude at this return, however it was found in outburst at 12th magnitude in July 1998 and was 7 magnitudes brighter than expected. It is well placed for UK observation, but is difficult to see with a magnitude between 11 and 13. I have glimpsed it a few times in mid March with the Northumberland, making it around 13th mag. Observing on April 9/10 with the Northumberland I could not see the comet, estimating it fainter than 13.8. NGC 2455 which lay nearby was clearly visible and estimated at 13.1 compared with the catalogued magnitude of 13.2. Observations received so far (34) give an uncorrected preliminary light curve following the second outburst of m = 10.2 + 5 log d + 0.0416abs(t-T+23.1). Observations in ICQ format, last observation 1999 April 29, updated 1999 August 12. Observations in ICQ format, last observation 1999 March 22, updated 1999 May 24. Comet 63P/Wild 1 Nakano reported observations made by T. Kojima, Chiyoda, on October 24.83 of this 13-year-period comet, missed at its 1986 return. These observations confirm a single-night detection at mag 22.4 by Hergenrother (1.5-m Catalina reflector) on Feb. 14. The prediction on MPC 27082 requires correction by Delta T = -0.35 day. Further details were given on MPEC 1999-V18. Kojima (0.25-m f/6.3 reflector) reported the comet at m1 = 16.5 and as diffuse without a tail on Oct. 24, at m1 = 15.9 and diffuse with condensation and a coma diameter of 30" on Nov. 4. [IAUC 7302, 1999 November 6]. It was a difficult object of around 14th mag on January 5. Observations in ICQ format, last observation 1999 November 8, updated 1999 December 15. Comet 88P/Howell is no longer visible. With a low inclination orbit, the comet sticks to the zodiacal constellations. The comet was discovered in 1981 by Ellen Howell with the 0.46-m Palomar Schmidt. It passed 0.6 AU from Jupiter in 1978, which reduced the perihelion distance, but the biggest change to its orbit occurred in 1585 when an encounter reduced q from 4.7 to 2.4 AU. Observations in ICQ format, last observation 1999 February 6, updated 1999 April 05. Comet 93P/Lovas 1 is no longer visible. Observations in ICQ format, last observation 1999 April 19, updated 1999 August 12. 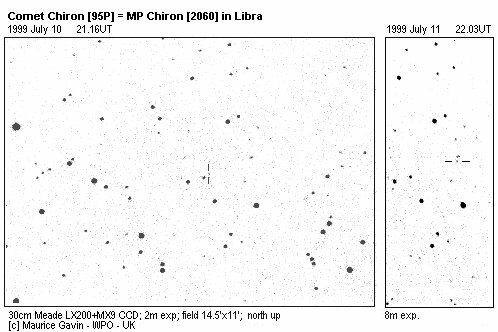 Comet/Asteroid 95P/Chiron was 16m when at opposition in late May in Libra. Maurice Gavin obtained an image of the comet on July 10 and 11. Observations in ICQ format, last observation 1999 June 12, updated 1999 July 7. Comet 106P/Schuster is a difficult object at mag 14. It is moving north, and will slowly fade. Observations in ICQ format, last observation 1999 November 28, updated 1999 December 15. Comet 114P/Wiseman-Skiff is near peak brightness. On December 7.8 I made it 14.0: in the Northumberland, but it was only visible with averted vision. On January 5 I was able to see it clearly at mag 14. 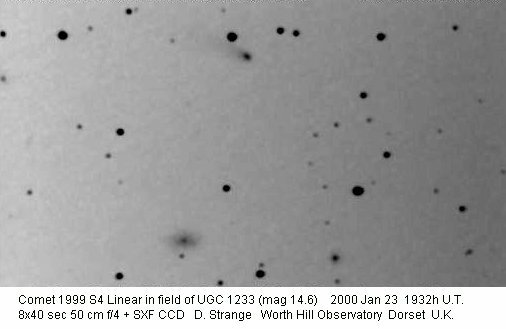 Comet 1998 X2 140P/Bowell-Skiff was identified on LINEAR images by Gareth Williams. Observations in ICQ format , last observation 1999 May 1, updated 1999 August 12. 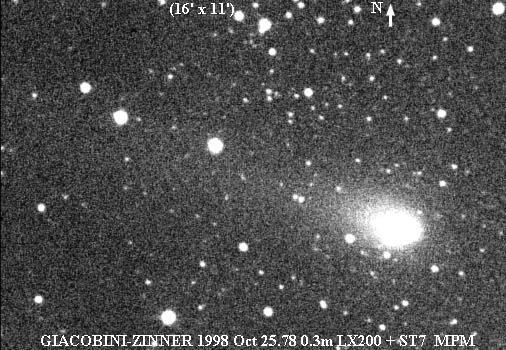 Comet 1999 P1 141P/Machholz 2 This periodic comet was predicted to be the brightest in 1999. It split into several fragments at its discovery return in 1994 and although expected to reach 7th mag, seems unlikely to do better than 10th. Donald Machholz discovered P/Machholz 2 (1994 P1) with his 0.25-m reflector at 10m in August 1994. It proved to have multiple components, first reported by Michael Jager (Vienna, Austria). The four secondary components could all be described by the same orbit, but with perihelion delayed by up to half a day from the primary. At times there seemed to be a faint trail of material linking the components. The comet has a short period of 5.2 years with a perihelion distance of 0.75 AU and aphelion just inside the orbit of Jupiter. The orbit has been slowly evolving, with progressive changes occurring about every 50 years, thanks to approaches to Jupiter. The most recent close approach was in 1982. With a relatively stable perihelion distance, which is slowly increasing, it is perhaps surprising that the comet was not discovered earlier. There was a favourable return in autumn 1978 when it might have reached 8th magnitude and very favourable returns in the autumns of 1920, 1937 and 1957 when it might have reached 6th magnitude. The fact that it was not discovered at any of these returns suggests either that the orbital evolution is slightly inaccurate, or that the absolute magnitude at the 1994 return was not typical. At present the earth passes about 0.25 AU outside the descending node and the orbital evolution will slowly decrease this distance, raising the possibility of meteor shower from the comet in a few hundred years time. This return is moderately favourable with the comet moving rapidly eastwards through Serpens (October), Scutum and Aquila (November), Aquarius and Capricornus (December) as it brightens from 14th to 7th magnitude. UK observers should be able to observe it from November at 10th magnitude, though more southerly observers may find it a month earlier. 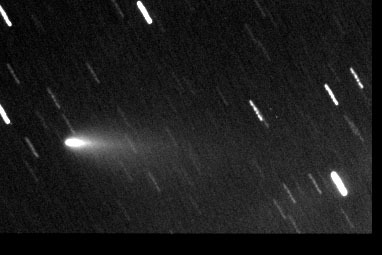 Robert H. McNaught recovered the comet on CCD images obtained with the 1.0-m f/8 reflector at Siding Spring on August 3.55. The object was of stellar appearance. The indicated correction to the prediction by B. G. Marsden on MPC 27082 (for component A) is Delta T = +0.8 day. Seeing was good on Aug. 4, and there was no sign of any other components within Delta T = +/- 1.5 days. The comet is located on the border of Sagitarius and Aquila, relatively low in the evening sky from the UK. The two components are currently some 55' apart. The A component brightened significantly in the last week of 1999 and is now around 10th mag, though beginning to fade and get more diffuse. The D component is perhaps two magnitudes fainter. The comet is still several magnitudes fainter than expected. Observations in ICQ format , Last observation 1999 December 1, updated 1999 December 1. 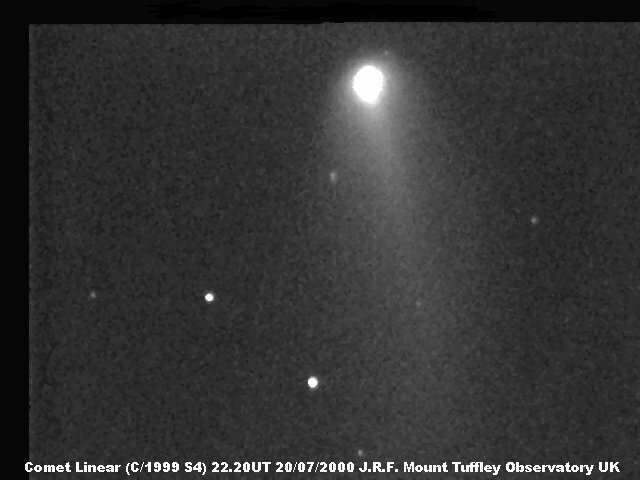 1999 A1 Tilbrook Justin Tilbrook (Clare, South Australia ) discovered a second comet on January 12.49 with his 0.2-m f6 reflector x70. [IAUC 7084, 1999 January 13]. This time it was a deliberate discovery, his first one had been accidental during a variable star patrol. Although it had perihelion inside the earth's orbit and was relatively close, it was intrinsically quite faint and faded after discovery. Andrew Pearce made some early observations, reporting it at a little fainter than 10th magnitude. It is now too faint for futher observation. Observations in ICQ format , last observation 1999 February 17, updated 1999 April 05.
were discovered with the SOHO LASCO coronographs and have not been observed elsewhere. They are sungrazing comets and were not expected to survive perihelion. 1999 K1 was one of the brighter objects. On May 20.47 UT, the comet was about 11 solar radii from the sun and showed a tail; on May 20.51 it was mag 6.8. A standard magnitude prediction suggested it could reach -4 magnitude, however as with most of the Kreutz group fragments it faded as it got closer to the sun. Some of the comets show no tail at all and it is possible that some supposed observations of Vulcan were actually tiny Kreutz group comets. I discovered SOHO-86=1999 S1 on the morning of September 17, spotting the object on C3 frames between 15:18 on September 16 and 05:18 on the 17th, which was the last one to be downloaded that morning. It was a moderately bright, though tail-less Kreutz group fragment. When it entered the C2 field of view it had a tail, but it rapidly faded. Information about the latest discoveries is available from the LASCO comet observations web site. SOHO experienced a malfunction on 1998 June 25 and contact with it was lost. It was located by radar on July 29, communication was established in early August and it resumed pointing at the Sun in mid September. The LASCO cameras were reactivated in October but further problems were encountered and the spacecraft did not return to action until February 1999. Further control problems were encountered in late November 1999. There are three LASCO (Large Angle Spectroscopic Coronographs) on the SOHO spacecraft, which orbits the sun at the earth's L1 Lagrangian point, 1.5 million km ahead of the earth. C1 has a field from 1.1 to 3 solar radii, C2 from 1.5 to 6 and C3 from 3.5 to 30. Brighter objects are often discovered in the real time data, but the fainter ones have to wait for the archival data to be searched which runs three or four months behind. SOHO has now discovered 94 comets (93 with LASCO), of which the majority are all members of the Kreutz group. of sungrazing comets. [Updated 1999 October 29]. So far, only 7 are not Kreutz group sungrazers. Further background information on the SOHO comets can be found from the LASCO comet observations web site. If you look at the archive of LASCO real-time movies, you will see two bright sungrazers in the C2 field at the same time at Christmas 1996. The LASCO images are downloaded every half an hour and you can view the Latest images or use the real-time JAVA movie player. 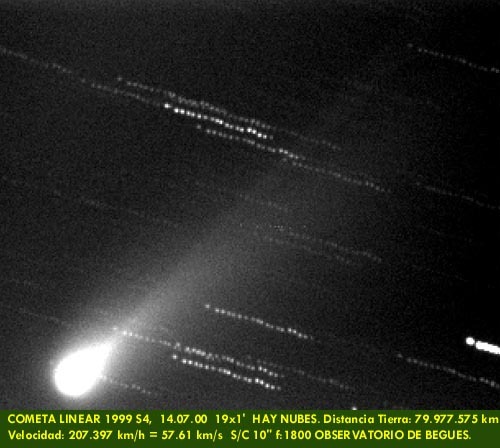 1999 D1 Hermann S M Hermann of the LONEOS team discovered a comet on images taken on February 20.4 [IAUC 7111, 1999 February 20]. It is an intrinsically faint short period comet. It faded after discovery. Observations in ICQ format , last observation 1999 March 22, updated 1999 April 05. 1999 DN3 P/Korlevic-Juric The 19th mag, apparently asteroidal object 1999 DN_3, observed by K. Korlevic and M. Juric at Visnjan (0.41-m f/4.3 reflector + CCD) on Feb. 18.97 and 24.0 UT (MPC 33833, MPS 4018), was linked by G. V. Williams, Minor Planet Center, to observations on Apr. 6 and 14 in routine asteroidal astrometry from LINEAR. 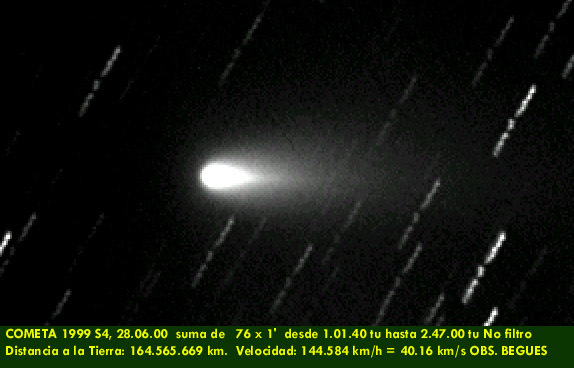 Owing to the unusual nature of the orbit, computed on May 13, the object was added to The NEO Confirmation Page. In response to this, further observations were reported on May 14.2 by D. A. Klinglesmith, III, and R. Huber (Etscorn Observatory) and by G. Hug (Farpoint Observatory). Williams also identified LONEOS observations of the object on Apr. 10. In addition, C. W. Hergenrother, Lunar and Planetary Laboratory, reports that observations made on May 14 with the 1.5-m Catalina reflector show the object to be cometary, with a compact, well-condensed 10" coma and a strongly curved 30" tail, starting in p.a. 45 deg and curving to p.a. 335 deg. [IAUC 7167, 1999 May 14]. The comet is distant and fading. A/1999 DP8 An interesting Trans Neptunian Object (TNO) was reported on MPEC 2000-C02. The 26th mag object, discovered with the 3.6-m Canada-France-Hawaii telescope on 1999 February 16.27 is in a moderately inclined elliptical orbit that has a perihelion distance of 35 AU and a period of 1250 years. It reached perihelion early in 1951. At aphelion it will be nearly 200 AU from the Sun. 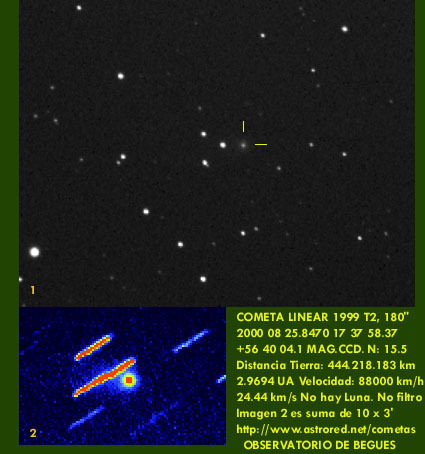 1999 E1 Li Weidong Li and M. Modjaz, Department of Astronomy, University of California at Berkeley discovered a 17th mag comet in the course of the Lick Observatory Supernova Search on March 13.18 [IAUC 7126, 1999 March 16]. 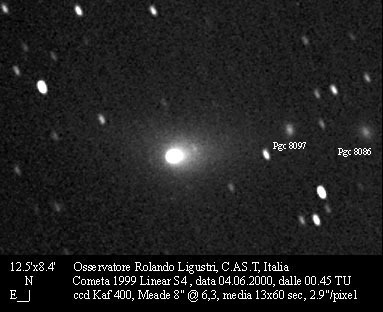 The object was found automatically by the Katzman Automatic Imaging Telescope (KAIT), recorded by Modjaz as a supernova candidate, and recognized by Li as a comet. Li then used the equipment to make confirmatory observations three nights later. 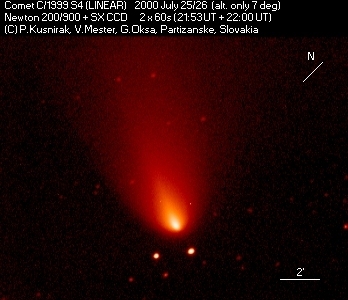 The comet shows an apparent tail in p.a. about 120 deg. It is in a distant parabolic orbit and will fade. Observations in ICQ format , last observation 1999 April 19, updated 1999 August 12. 1999 F1 CATALINA On Apr. 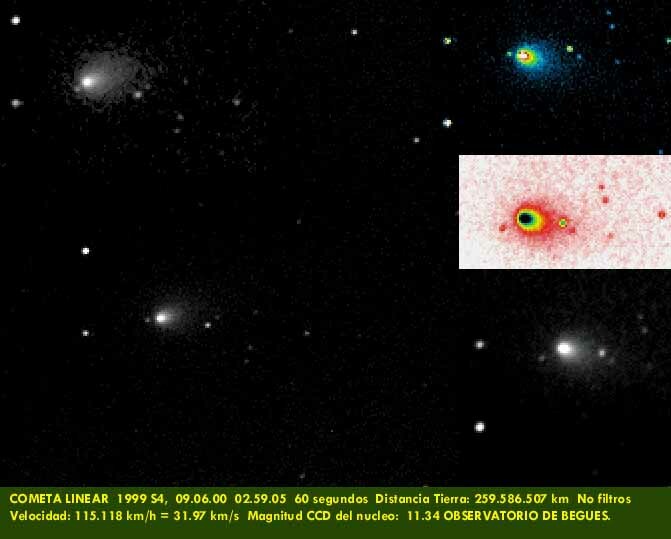 17, T. B. Spahr, Lunar and Planetary Laboratory, reported the automatic discovery of an 18th mag object of unusual motion and stellar appearance in the course of the Catalina Sky Survey (0.41-m Schmidt + CCD) on March 23.32. Spahr obtained follow-up data on Apr. 16 and 17. 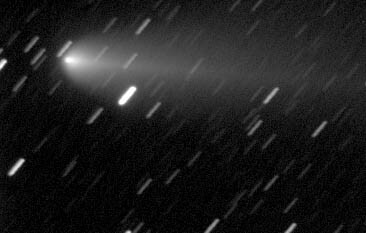 Computations by B. G. Marsden suggested that the object was a long-period comet in a highly-inclined orbit, yielding an identification in Mar. 13 Spacewatch data. CCD images (660 s total exposure) obtained with the Catalina 1.5-m reflector by J. Bialozynski, D. Dietrich, C. Greenberg, E. Hooper, D. McBee, D. McCarthy, J. Pici, G. Rudnick, and C. Vedeler, and co-added by C. W. Hergenrother, show a faint coma of diameter 8"-10". [IAUC 7148, 1999 April 20]. The comet is currently very distant (over 8 AU) and not due to reach perihelion until 2002, but even then it will be 5.8 AU from the Sun. Observations in ICQ format , negative observation 1999 May 7, updated 1999 July 19. 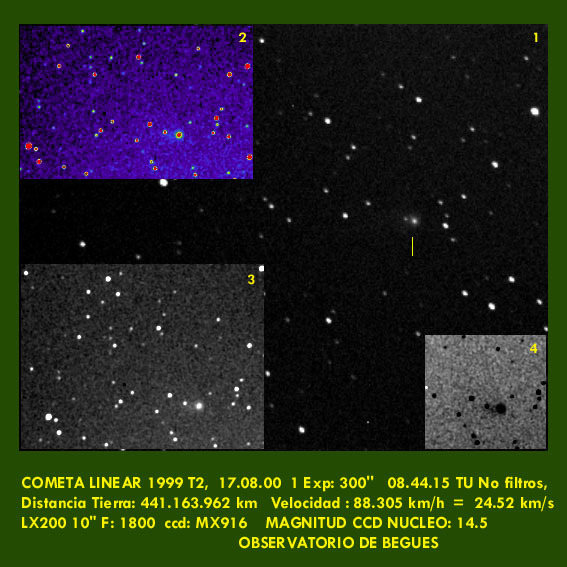 1999 F2 Dalcanton Julianne Dalcanton, University of Washington; S. Kent, Fermi National Accelerator Laboratory; and S. Okamura, University of Tokyo, on behalf of the Sloan Digital Sky Survey (SDSS), reported the discovery by Dalcanton of a comet on several SDSS images taken on March 20 through different filters; an r'-band filter shows a tail about 2' long and a sharp nucleus inside a coma of diameter about 20". Upon receipt at the Central Bureau on June 7 of the astrometry, spanning only 72 s of time, G. V. Williams found a possible link with a single-night apparently asteroidal LINEAR object in archival data for March 24; this permitted Williams to find further apparently asteroidal LINEAR observations, first on Feb. 23, then on May 12, and finally on 1998 June 18. At this point, the object was placed on the NEO Confirmation Page in expectation that additional observations would confirm the cometary nature. 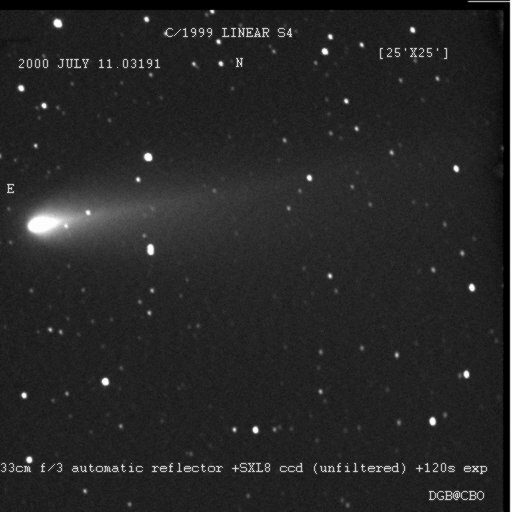 In response, confirming CCD observations showing cometary appearance were received from M. Tichy and Z. Moravec at Klet on June 7.9 UT (coma diameter > 15", tail > 50" in p.a. 230 deg) and from R. A. Koff at Thornton, CO, on June 8.2 (15" coma, 35" tail in p.a. 195 deg). Dalcanton subsequently forwarded single-night LONEOS observations obtained on March 28 and found by G. Magnier. [IAUC 7194, 1999 June 8]. The comet is distant, but intrinsically quite bright. It will fade from its current 15th magnitude. Observations in ICQ format , last observation 1999 June 30, updated 1999 July 27. 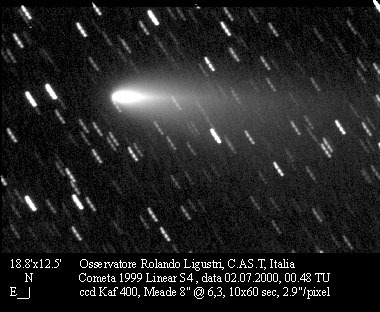 1999 G1 LINEAR another object discovered by LINEAR has been identified as a comet. [IAUC 7140, 1999 April 10]. The 17th mag object is in a distant parabolic orbit and will fade. Observations in ICQ format , last observation 1999 April 13, updated 1999 May 18. 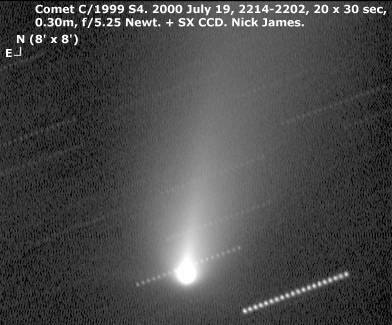 1999 H1 Lee Steven Lee (a night assistant at the Anglo-Australian Telescope in New South Wales) discovered this 9th magnitude comet on April 16.5 with a 0.41-m f/6 Newtonian reflector (about x75) at a star party near Mudgee, New South Wales. [IAUC 7144, 1999 April 16]. I picked it up in 14x100B on July 27.09 at mag 6.1, though it was a difficult object in a bright twilight sky. It was again just visible on July 30.09 at aroung mag 6.5. It was any easy object on August 6.1 at mag 7.5. I observed it low down on August 11.1 and made it 6.9 (HS) in 14x100B. Andrew Pearce also observed it in mid August, making it a little fainter. Denis Bucynski imaged the comet on Aug 29.9. On August 30.9 it was around 7.5. It was an easy object from the centre of Cambridge on September 4.1 in 14x100B. It shows a prominent anti-tail in this image by Rolando Ligustri on September 8th. From a dark sky site on September 12.1 it was easy in 20x80B at mag 7.9. The coma was quite large and well condensed. It was still a little brighter than 8th mag on September 18.14. The comet is becoming less condensed and has faded to around 9th magnitude at the beginning of October. On October 18.08 it was large and diffuse in my 14x100B at 9.3. It rapidly became very diffuse in the last week of October and may now be very difficult to spot. Observations in ICQ format , last observation 2000 January 6, updated 2000 August 16. 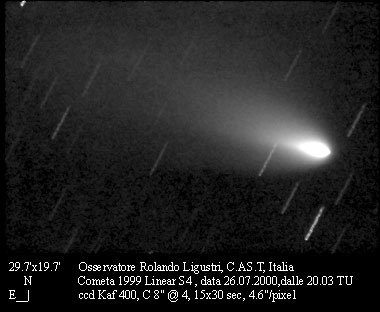 1999 H3 LINEAR An apparently asteroidal 17th mag object discovered by LINEAR on April 22.31, and noted on The NEO Confirmation Page, was reported as cometary by Klet and Ondrejov observers. 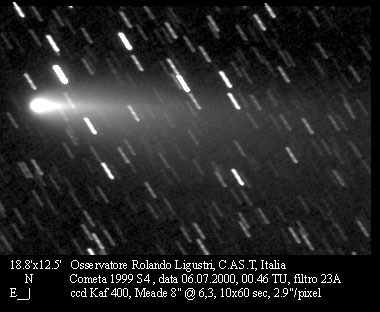 [IAUC 7151, 1999 April 23] The comet is in a distant parabolic orbit and is no longer visible. Observations in ICQ format , last observation 2000 June 1, updated 2000 November 22. 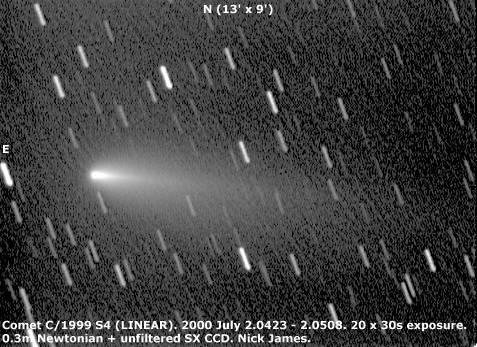 1999 J2 Skiff Brian Skiff of the Lowell Observatory Near-Earth Object Search (LONEOS) team discovered a 16th mag comet on May 13.40 [IAUC 7165, 1999 May 13]. The comet is at high northern declination, and is very distant at over 7 AU, with perihelion in October 1999. It will remain near 15th mag for some time. Observations in ICQ format , last observation 2001 June 25, updated 2002 April 2. 1999 J3 LINEAR An apparently asteroidal 19th mag object discovered by LINEAR on May 12.28, and noted on The NEO Confirmation Page, was reported as cometary by Klet observers [IAUC 7166, 1999 May 13]. Estimates in mid July put it at 12th mag. Jose Carvahal estimated it at 12.4 on August 5.9. By early September it had reached 10th mag. 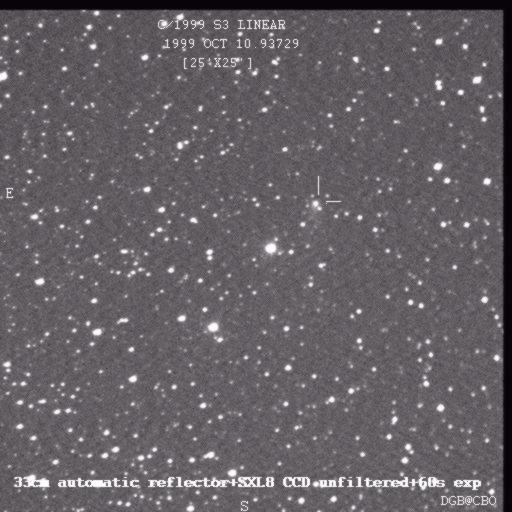 It was mag 9.6 in 20x80B from a dark sky site on September 12.1, rather smaller than comet Lee. Observing it from my back yard in central Cambridge on September 18.16 I made it 8.7 in 14x100B. It was small and well condensed. On October 18.18 it was moderately condensed in my 14x100B at mag 8.2. It was significantly brighter in smaller aperture binoculars. It is now a faint southern hemisphere object. Observations in ICQ format , last observation 1999 November 21, updated 2000 February 25. 1999 J4 LINEAR Another asteroidal object reported by LINEAR on May 15.32 UT (mag 18.2-18.8) with unusual motion was noted on The NEO Confirmation Page, and it was subsequently reported to be cometary in appearance by several observers, including now M. Elowitz and F. Shelly from May 17 LINEAR observations. P. Pravec, U. Babiakova, and P. Kusnirak (Ondrejov, 0.65-m f/3.6 reflector + V filter) reported a coma diameter of 0'.2 and a tail 0'.6 long in p.a. 160 deg, and J. Ticha and M. Tichy (Klet, 0.57-m f/5.2 reflector) noted the object to be slightly diffuse (coma diameter about 7"), on May 16.9. [IAUC 7170, 1999 May 17]. The comet is in a distant parabolic orbit. 1999 J5 P/LINEAR An apparently asteroidal 19th mag object reported by LINEAR on May 12.36 and 17, and linked by G. V. Williams to LINEAR observations on June 8 and 10 by way of a cometlike orbit, was posted on The NEO Confirmation Page for additional observations. P. Pravec and P. Kusnirak, Ondrejov, reported that their June 12 CCD images showed a faint coma and a tail marginally visible to the southwest. Also, A. Sugie, Dynic Astronomical Observatory, reported strong condensation and a coma diameter of 12" on June 14. [IAUC 7201, 1999 June 14]. The comet will fade. 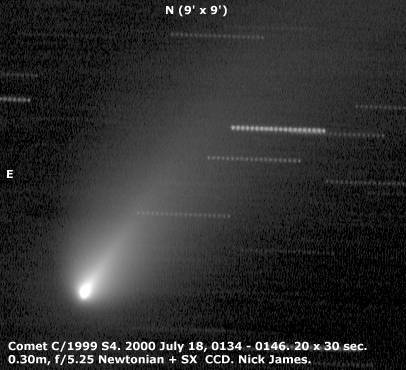 1999 J6 SOHO This SOHO comet of the Marsden group, discovered by Michael Oates on 2000 March 21, passed 0.03 AU from the Earth on 1999 June 9 - 11. No observations were reported at the time by any of the major search programs. 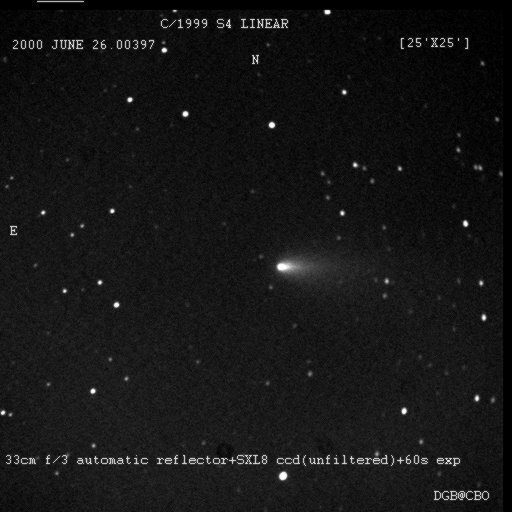 1999 K2 Ferris William D. Ferris discovered an 18th mag comet on CCD frames taken with the 0.59-m LONEOS Schmidt telescope on May 19.37. Measurer B. Koehn noted that the comet showed a well-condensed nucleus, a coma of diameter about 15", and a faint tail about 20" long in p.a. 225 deg on May 19. Additional astrometry appeared on MPEC 1999-K22. 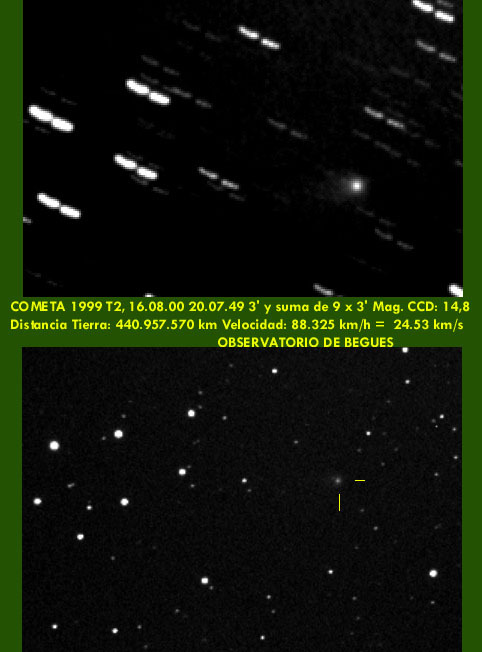 May 22 observations by J. Ticha and M. Tichy (Klet) showed the comet as diffuse with a 12" coma; observations on the same night by L. Kornos and P. Koleny (Modra) also showed a coma. C. W. Hergenrother and A. E. Gleason (Catalina 1.5-m reflector) reported a 20" coma and a 20" tail in p.a. 230 deg. [IAUC 7175, 1999 May 22]. The comet is in a distant parabolic orbit and won't brighten much from its present visual magnitude of around 16. Observations in ICQ format , last observation 1999 May 31, updated 1999 June 14. 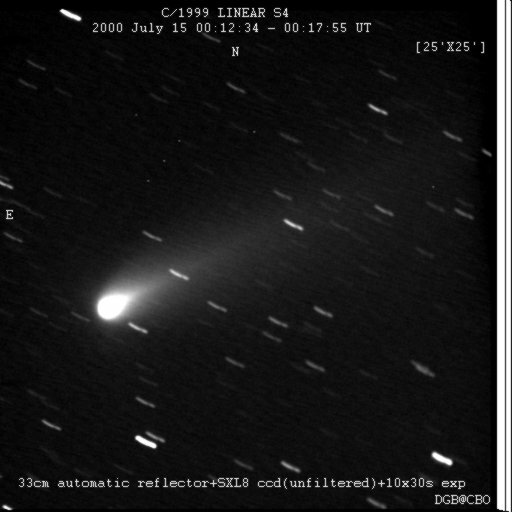 1999 K3 LINEAR M. Elowitz, Lincoln Laboratory, Massachusetts Institute of Technology, reported the discovery of 19th magnitude, apparently cometary object in LINEAR data on May 20.27. Following posting of this object on The NEO Confirmation Page, numerous observers confirmed the cometary appearance, and additional astrometry and orbit were given on MPEC 1999-K23. Around May 22.0 UT, L. Sarounova (Ondrejov) reported coma diameters about 20" and 15"; Ticha and Tichy report a 10" coma and a wide tail in p.a. 245 deg; and coma was also noted by Kornos and Koleny. [IAUC 7175, 1999 May 22]. The comet is past perihelion and is fading from visual magnitude 16. Observations in ICQ format , last observation 1999 August 13, updated 1999 August 17. 1999 K4 LINEAR Another apparently asteroidal object of 19th magnitude found by LINEAR on May 17.33, and posted on The NEO Confirmation Page, has been reported as cometary by M. Hicks (Table Mountain; faint coma of diameter about 5" on May 21) and by C. W. Hergenrother and A. E. Gleason (Catalina 1.5-m reflector; highly condensed coma with a faint 10"-15" tail in p.a. 170 deg on May 22). [IAUC 7176, 1999 May 22] The comet is intrinsically faint and will fade. 1999 K5 LINEAR Another apparently asteroidal, 17th mag object discovered by LINEAR on May 20.32 and posted on The NEO Confirmation Page, has been reported as cometary by several observers. CCD frames taken by D. D. Balam (Victoria) on May 23 show a condensed coma with a 16" fan-shaped tail in p.a. 303 deg. On May 24, L. Kornos and P. Koleny (Modra) report a coma diameter of about 15" and a short tail in p.a. 330 deg, and G. Hug (Farpoint Observatory) indicated a hint of coma in p.a. about 300 deg. [IAUC 7178, 1999 May 24]. This is LINEARs 23rd discovery in around 14 months. The comet is currently around 13th mag visually, and is now at perihelion at high southern declination. Michael Mattiazzo reported it at 13.2 on July 4. Observations in ICQ format , last observation 2000 October 19, updated 2000 November 22. 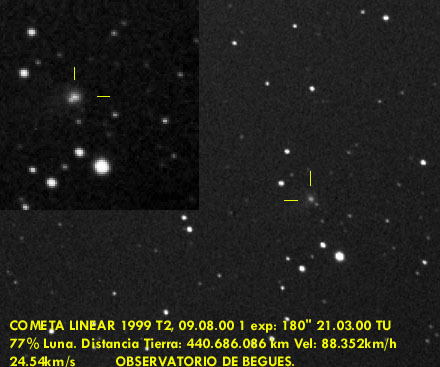 1999 K6 LINEAR Yet another apparently asteroidal object, of 18th mag, discovered by LINEAR on May 20.23, and posted on The NEO Confirmation Page, has been reported as cometary, on May 24 by L. Sarounova (Ondrejov; faint coma with condensed nucleus) and by M. Tichy and Z. Moravec (Klet; diffuse with coma diameter >/= 10"). 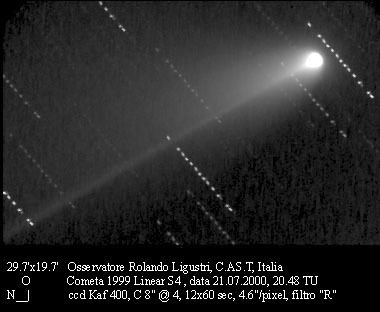 [IAUC 7180, 1999 May 25] The comet will brighten a little, but is unlikely to do better than 15th mag. Observations in ICQ format , last observation 1999 July 31, updated 1999 August 30. 1999 K7 LINEAR A 19th mag object discovered by LINEAR on May 24.34 was reported as possibly cometary by M. Elowitz, Lincoln Laboratory, with an apparent tail in p.a. about 220 deg. Confirmation of cometary activity was made by D. D. Balam (Victoria), who noted no tail but measured a 7" diffuse coma. 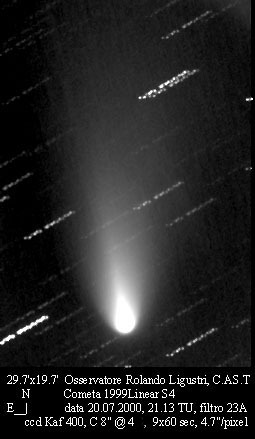 [IAUC 7181, 1999 May 26] The comet will fade from its present magnitude. 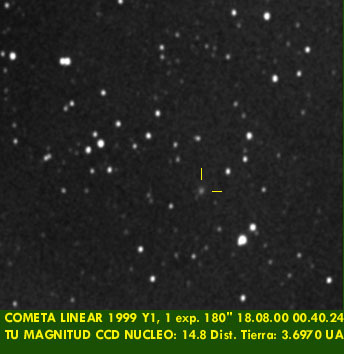 1999 K8 LINEAR Another apparently asteroidal 19th mag object discovered by LINEAR on May 26.38 and posted on The NEO Confirmation Page, was reported as cometary on May 27 by L. Sarounova (Ondrejov; coma diameter at least 30" with condensed nucleus), by M. Tichy and Z. Moravec (Klet; 10" coma), and by R. A. Koff (Thornton, CO; diffuse coma of diameter about 8"). [IAUC 7182, 1999 May 27]. The comet is a distant one and will remain near 14th mag until 2000. I was unable to detect any trace of nebulosity in the predicted position with the Northumberland on October 2.8 despite a limiting magnitude of around 15. Observations in ICQ format , last observation 2000 December 23, updated 2001 May 8. 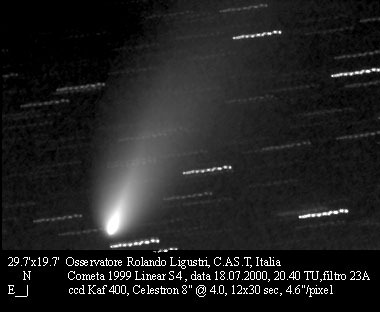 1999 L2 LINEAR M. Elowitz and F. Shelly reported the discovery of a 18th mag comet with a coma but no distinct tail in LINEAR data on June 11.24. In response to posting on The NEO Confirmation Page, G. R. Viscome (Lake Placid, NY) reported that the object showed a 16" coma and moderately strong condensation, but again no discernible tail. 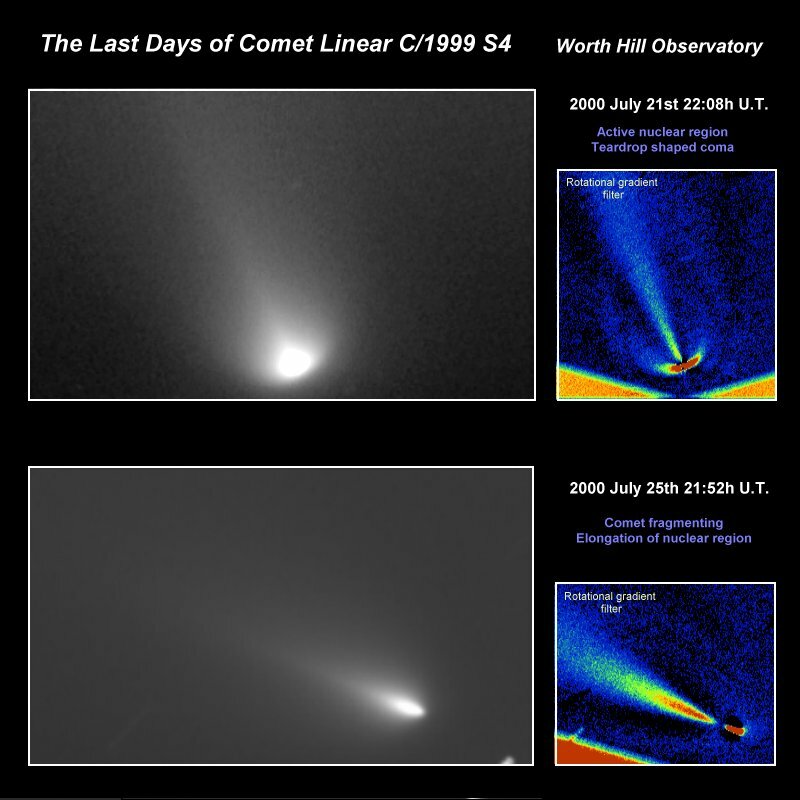 [IAUC 7199, 1999 June 12] The comet is around 16th mag visually and reaches perihelion in August and will brighten a little. The comet was visible to UK observers, and at its brightest in late January. I observed it with my 0.20-m SCT on January 10.17 from a dark sky site and made it 12.3, DC2 and diameter 2.0'. A brief observation on January 31.0 with the Northumberland refractor revealed a well condensed object of between 11th and 12th magnitude. On February 8.8 it was around 11.5, but slightly less condensed than the day before. It is no longer visible. Observations in ICQ format , last observation 2000 April 7, updated 2000 August 16. A/1999 LT1 (LINEAR) is an asteroid of 18th magnitude, discovered by LINEAR on 1999 June 4.21. It is in a 5.14 year orbit, with perihelion at 1.02 AU and an eccentricity of 0.66. It next reaches perihelion in mid July 2004. [MPEC 2004-A01, 2004 January 1] The orbit is typical of a Jupiter family comet, and it can approach Jupiter to within 0.5 AU. It is also a PHA, approaching to 0.045 AU of the Earth at the descending node. 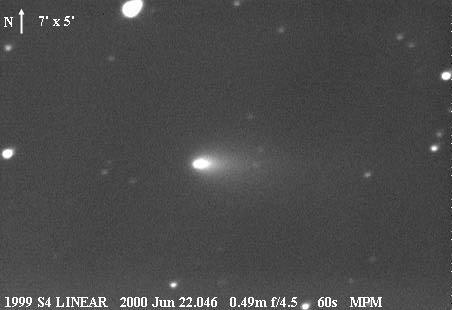 1999 M3 SOHO A possible member of the Marsden group of comets was discovered by Rainer Kracht in archival SOHO imagery from 1999 June 30 on 2002 February 27. 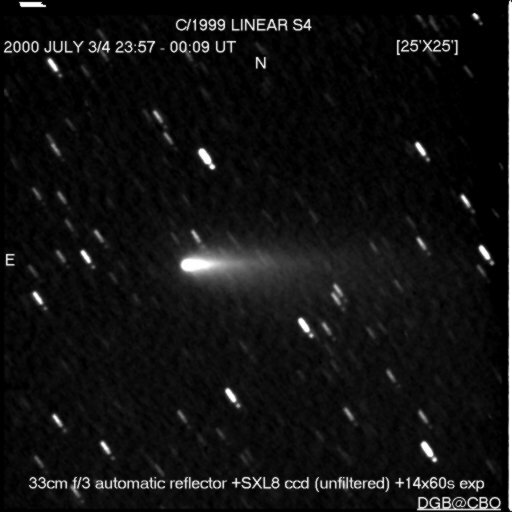 1999 N2 Lynn Daniel W. Lynn, Kinglake West, Victoria, Australia, visually discovered an 8th mag comet using handheld 10x50 binoculars on July 13.45 [IAUC 7222, 1999 July 14]. It is now visible to UK observers, but will fade. I glimpsed it in 20x80B on August 5.9 at 7.7, and Jose Carvahal also estimated it at 7.7. I made a further observation in company with Andrew Pearce on August 10.9 and estimated the comet at about 7.6 in 20x80B. It isn't fading much and was a similar magnitude during the IWCA. At the end of August I estimated it at 9.6 in the Thorrowgood refractor x40. By early September it was 10th mag. As 2000 begins it should still be around 13th mag, but few observations have been reported since November. Observations in ICQ format , last observation 2000 January 9, updated 2002 June 23. 1999 N4 LINEAR =LINEAR 30 Yet another LINEAR discovery with unusual motion, which was placed in The NEO Confirmation Page and found to have a retrograde orbit. At the request of the Central Bureau, some of the observers making astrometric observations examined their images carefully and concluded that the object was a comet. M. Tichy (Klet, 0.6-m reflector) noted comae of diameter about 6" on July 14.9 and about 7" on July 15.9 UT. L. Sarounova (Ondrejov, 0.6-m reflector) indicated a small coma, some lack of condensation but no tail on July 16.9. F. B. Zoltowski (Woomera, 0.3-m reflector) remarked on a compact, diffuse image with an asymmetrical distribution that may indicate a small, faint tail at p.a. around 90 deg on July 17.6. [IAUC 7226, 1999 July 17]. The comet has m2 around 18th mag and is a distant object reaching perihelion next year. Observations in ICQ format , last observation 2000 August 27, updated 2000 November 22. 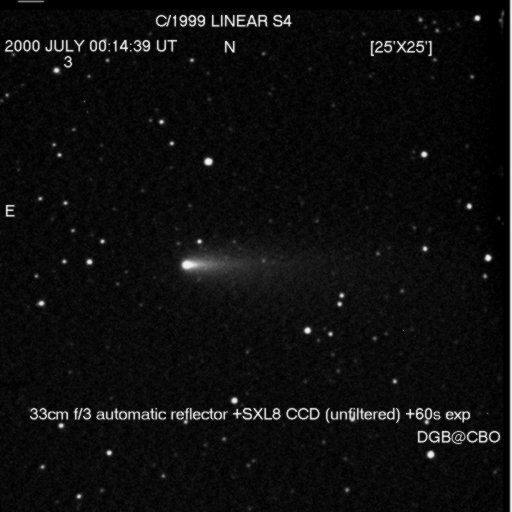 1999 R1 SOHO =SOHO 85 Doug A. Biesecker, SM&A Corporation and Goddard Space Flight Center, reported observations of what was presumably a comet, not a Kreutz sungrazer, discovered by T. Lovejoy in SOHO/LASCO C3 data and later also recognized in earlier C2 data. It was observed from September 4.90 to September 6.26, reaching 6th mag at best and no tail was detected. [IAUC 7251, 1999 September 9] Doug compiled a movie loop showing the comet, but this is no longer available. 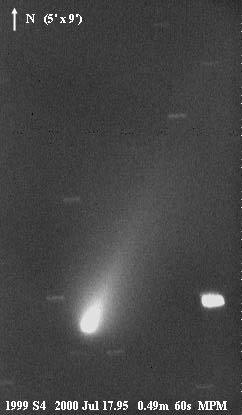 1999 R2 P/Ge-Wang Jim Scotti, Lunar and Planetary Laboratory, recovered comet P/1988 V1 (= 1988o = 1988 VIII) with the Spacewatch 0.9-m telescope at Kitt Peak on September 15.44. The nuclear magnitude m2 was 22.1. On September 15 there was a coma 12" across and a tail extending 0'.53 in p.a. 266 deg. On September 16 the coma diameter was 11", and the tail extended 0'.47 in p.a. 267 deg. The indicated correction to the prediction by S. Nakano on MPC 27081 was Delta T = -5.5 days. The comet is unlikely to become brighter than 19th mag. [IAUC 7255, 1999 September 17]. A/1999 RG33 Details of an 18th mag asteroid, discovered by the Catalina sky survey program on September 4.43 were given on MPEC 1999-R34 [September 12], with an improved orbit on MPEC 2000-A41 [January 11]. The asteroid is in a 29 year periodic orbit with a perihelion distance of 2.1 AU. 1999 RO28 P/LONEOS C. Hergenrother, Lunar and Planetary Laboratory, reported that a co-added 600-s CCD exposure with the Steward Observatory 2.3-m reflector on Sept. 13 of 1999 RO_28 (discovered by LONEOS on September 7.33, with details given on MPEC 1999-R23) showed a stellar condensation with a faint 20" tail in p.a. 310 deg. M. Tichy and J. Ticha, Klet, later reported a faint coma of diameter 8" and 7" on images taken on Sept. 8.93 and 10.02 UT, respectively. Observations by J. V. Scotti with the Spacewatch telescope at Kitt Peak on Sept. 15.4 showed a coma diameter of 9" (m_1 = 18.6-18.7, m_2 = 20.6-21.0) and a 0'.72 tail in p.a. 308 deg. [IAUC 7253, 1999 September 15]. The comet has a 6.5 year period and will fade as it recedes from the Earth. 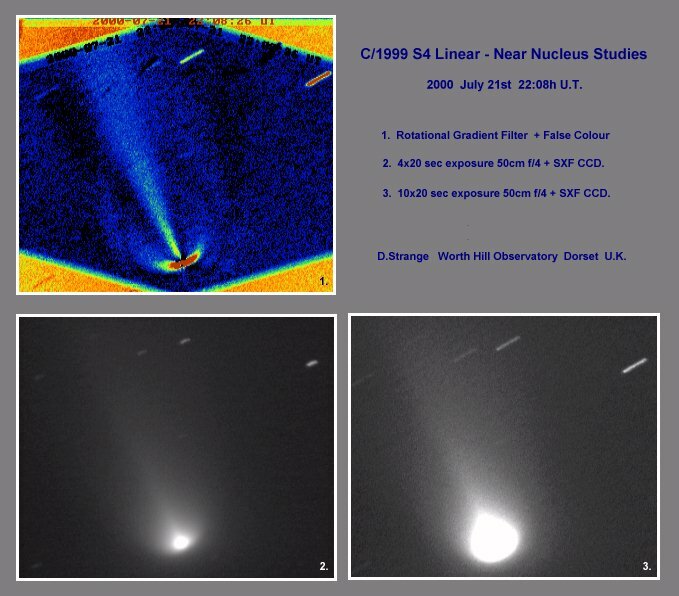 1999 S2 McNaught-Watson Rob H. McNaught, Australian National University, reported his discovery of a comet on an R survey film taken with the U.K. Schmidt Telescope by F. G. Watson on September 19.72. The comet showed a very strong central condensation, a weak circular coma of diameter 20", and a diffuse tail 3'.5 long in p.a. 210 deg. 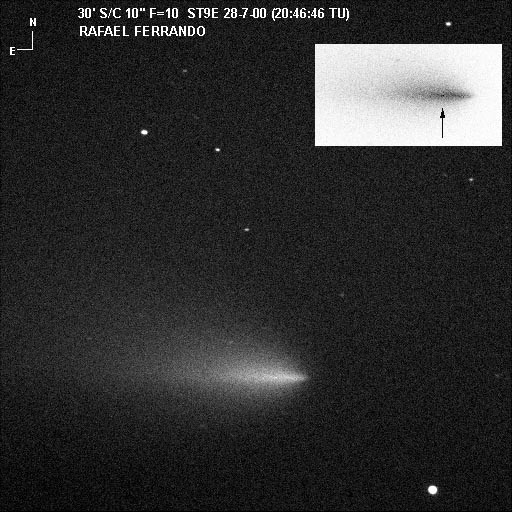 Confirming CCD images by McNaught with the 1.0-m f/8 reflector at Siding Spring taken on September 21.6 yielded m_2 = 20.1-20.2. [IAUC 7260, 1999 September 21] The initial orbit is very uncertain, but suggest that the comet is intrinsically bright, but very distant and although perihelion is a couple of years off, it won't get brighter than 14th mag. 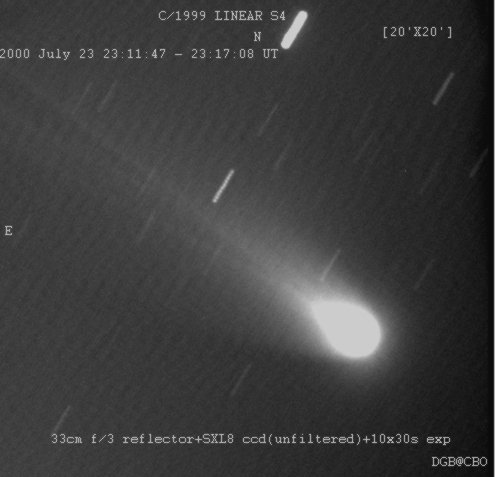 1999 S3 LINEAR = LINEAR 31 M. Bezpalko reported the discovery by LINEAR of a 16th mag comet on September 24.34. Additional observations were reported, following posting on the NEO Confirmation Page, giving m1 near 13th mag. [IAUC 7264, 1999 September 24]. The comet reaches perihelion in early November and will brighten a little to 13th mag before fading. The comet was relatively easy to see with the Northumberland on Oct 2.8, however its magnitude on the RX And sequence was only 14.0. I could see a star of mag 15.6 on this sequence, rather fainter than I would normally expect to detect. My impression was that the brightness was closer to the 12.5 reported by other observers. Denis Buczynski imaged the comet on Oct 10.9. Observations in ICQ format , last observation 2000 February 11, updated 2000 August 16. The comet is making its first visit into the inner solar system and such comets often brighten less quickly than expected. Professional observations show highly variable emissions. The orbit requires large non gravitional parameters and this combined with the faint absolute magnitude suggests that it is a small variably active object. As described above recent observations suggest that it may have fragmented, though there is some 'hype' on the topic, for example from Space Science. All reports of the comet's decease should be taken with a modicum of caution. Note the amateur observations suggest that a burst of activity between July 20 and 21, caused a brief brightening of the comet, followed by a more rapid fade, although the professionals persist in giving a later date. Hubble images taken on August 5 show the the comet fragmented into a number of cometisimals, confirming the concept that comets are a loose aggregation of smaller bodies, cemented together by ice and dust. Further images taken the next day by the ESO VLT show significant changes to the distribution of the cometisimals. Martin Mobberley imaged the comet on October 13.9. David Strange imaged the comet on January 23.8. 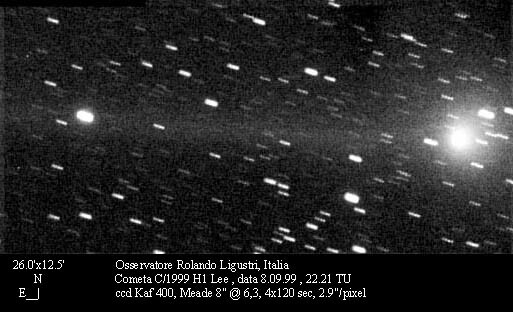 Seiichi Yoshida reported a negative CCD observation on April 28, implying that the comet was fainter than at least 11th magnitude. KenIchi Kadota succeeded in recovering the comet on May 4, when he estimated it at 13.0, though at very low altitude. 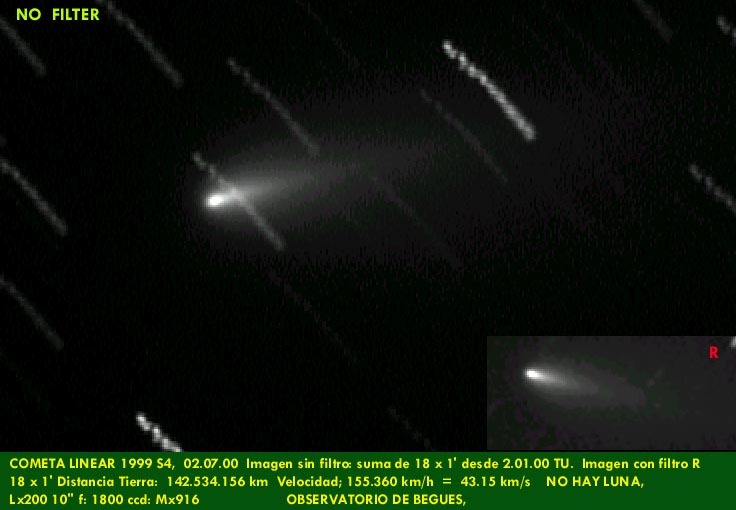 Several observers recovered it at the beginning of June with C Segarra reporting it at 10.5 visually. Rolando Ligustri imaged it with CCD on June 1 when it was 9.9 and on June 4, June 23, July 1, July 2, July 6, July 18 July 20, July 21, July 26, July 30. 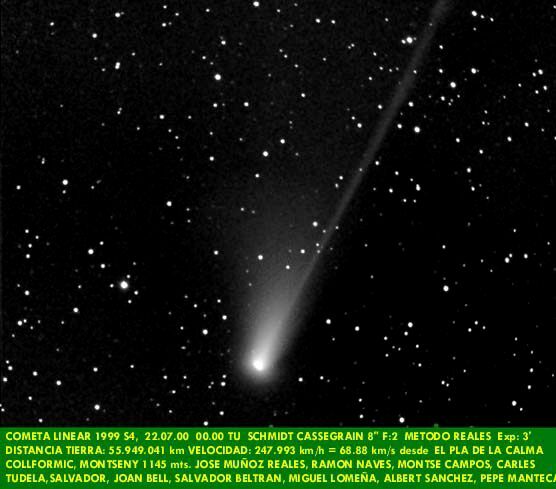 Pepe Manteca imaged the comet on June 9, June 22, June 28, July 2, July 12, July 14, July 22. 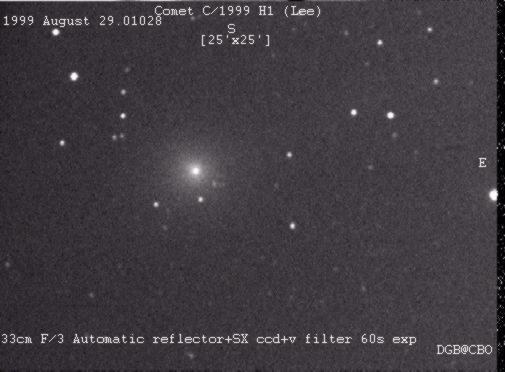 Martin Mobberley imaged the comet on June 22 when it was about 9th mag and on July 17. Denis Buczynski has imaged it on June 26, June 27, July 03, July 04, July 11, July 15/16, July 16/17 July 19, July 23 David Strange has imaged it on June 26, July 21 and on July 25 as it fragmented. Nick James imaged it on July 2, July 18 July 19 July 20. R Ferrando imaged it on July 9, July 28. John Fletcher imaged it on July 20 Maurice Gavin imaged the comet on July 16 and also obtained a spectrum. Christian Buil imaged the comet and obtained spectra on July 17. Gabriel Oksa imaged the comet on July 25 . 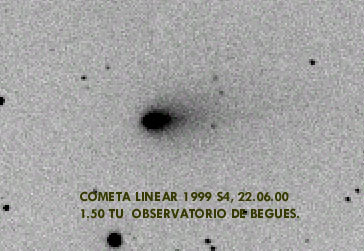 I picked up the comet in my 20cm LX200 x75 on June 7.05, it was mag 9.9, DC3, coma diameter 1.1'. I did not seen again for 34 days due to a lengthy spell of cloudy weather over eastern England. I saw it again on July 11.94 it was 7.4 in 20x80B, coma diameter 3.1', DC5. Unusually it cleared as it became dark on July 14 and I made another observation on July 14.9, the comet was 7.1 in 20x80B, DC5, coma diameter 3', tail 20' in pa 310. On July 16.9 the comet had brightened to 6.8 in 20x80B despite the nearly full moon. It was a similar magnitude on July 18.9 and 19.9. It was markedly brighter on July 21.9 than it was on July 20.9 with a prominent stellar condensation. Observations with 8x30B on July 21.9 gave a mag of 6.0 suggesting it could be seen with the naked eye from a really dark site. The extrapolation to the end of the year is shown in the light curve. The comet is currently at least two magnitudes fainter than the mean. Observations in ICQ format , last observation 2000 August 6, updated 2001 May 2. 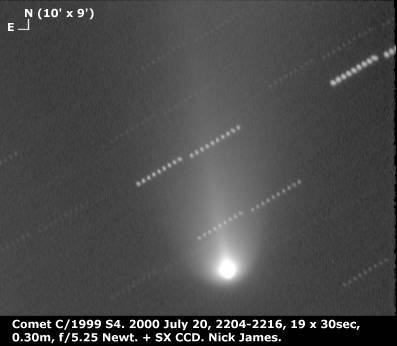 1999 T1 McNaught-Hartley Robert H. McNaught, Research School of Astronomy and Astrophysics, Siding Spring Observatory, reported his discovery of a 15th magnitude comet on a plate taken by Malcolm Hartley with the 1.2-m U.K. Schmidt Telescope on October 7.64. The strongly condensed comet showed a 8" coma and a very faint 1' tail in p.a. 320 deg. Additional astrometry was published on MPEC 1999-T42. I. P. Griffin, Auckland Observatory, reported a condensed coma of diameter 7" on CCD exposures taken on October 11.4 UT (0.5-m telescope). A. Becker and C. Stubbs, University of Washington; and J. Perez, Cerro Tololo Interamerican Observatory (CTIO) noted a tail in p.a. 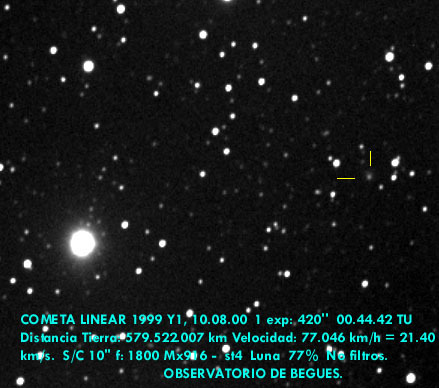 328 deg on a CCD exposure taken with the CTIO 0.9-m telescope on Oct. 11.19. [IAUC 7273, 1999 October 11]. The observations show that it reached a peak brightness of around 7.5, as was suggested by the preliminary light curve. 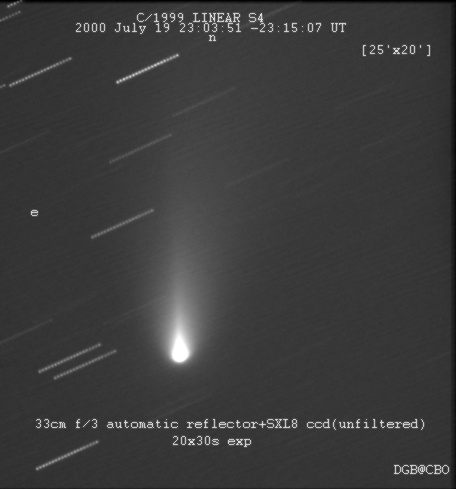 Andrew Pearce and Stuart Rae picked up the comet at around 13th magnitude in early June. It was 12.7 when Stuart Rae observed it on July 7.7. Observations from Andrew and Michael Mattiazzo in September made it a little brighter than 10th mag. I was able to observe it from the Falkland Islands on November 19 and 20. A gusty wind and ever brightening sky made observation difficult, however I located the 8th magnitude comet in my short focus 90mm refractor, noting a distinct central condensation in 4' diameter coma. I viewed it again from the UK on January 23.20 when it was an easy binocular object at 7.9. On observation in bright moonlight on February 12.09 put it at 8.2 in 20x80B. By early March it had become much more diffuse and was around 9th magnitude. On April 24 I estimated it at around 12th mag in the Thorrowgood refractor. Observations in ICQ format, last 2001 September 15, updated 2002 April 2. 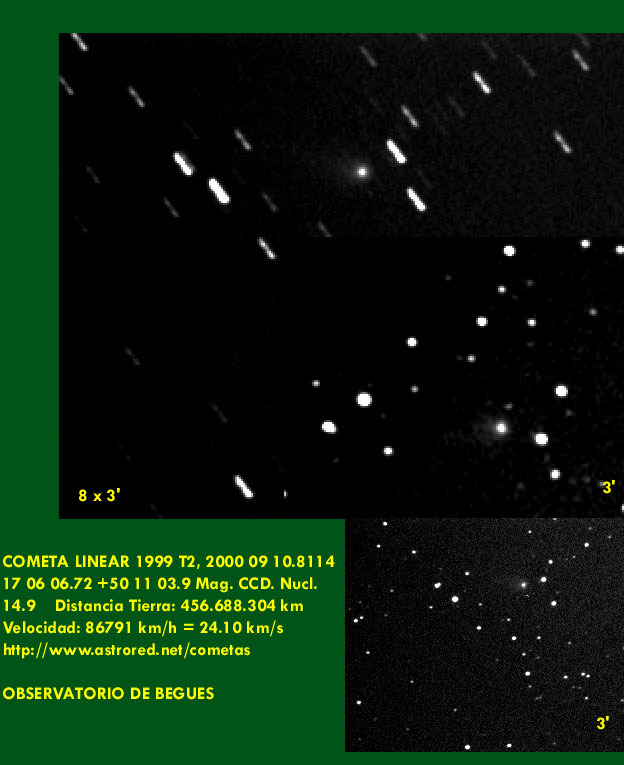 1999 T2 LINEAR F. Shelly reported the discovery by LINEAR of an 18th mag comet on October 14.16. Additional observations were reported following posting on the NEO Confirmation Page [IAUC 7280, 1999 October 14]. The comet will reach perihelion in November 2000 and reached 13th magnitude in the late summer. Denis Buczynski imaged it on 2000 May 31.04 I estimated it as fainter than 13.1 around the same time and Denis' image shows that it was significantly fainter than this. 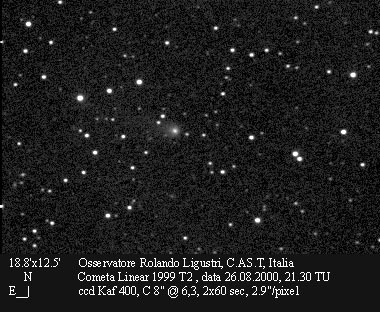 Rolando Ligustri imaged the comet on August 26. 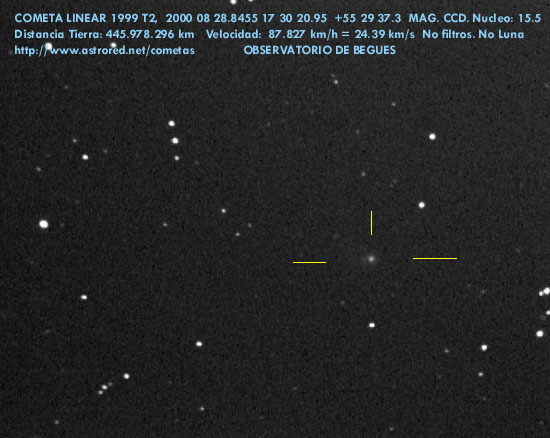 Pepe Manteca imaged the comet on August 9, August 16, August 17, August 25, August 28. September 4, September 5 September 7, September 9 September 10. I observed the comet on September 26.8 and estimated it at 13.6, with a small, moderately condensed coma. 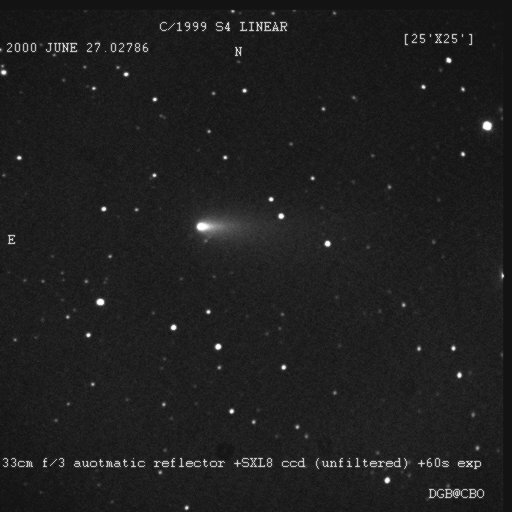 On 2001 April 24 I was able to see the comet clearly in the Northumberland refractor, estimating it at 13.5. Observations in ICQ format, last observation 2001 July 12, updated 2002 April 20. 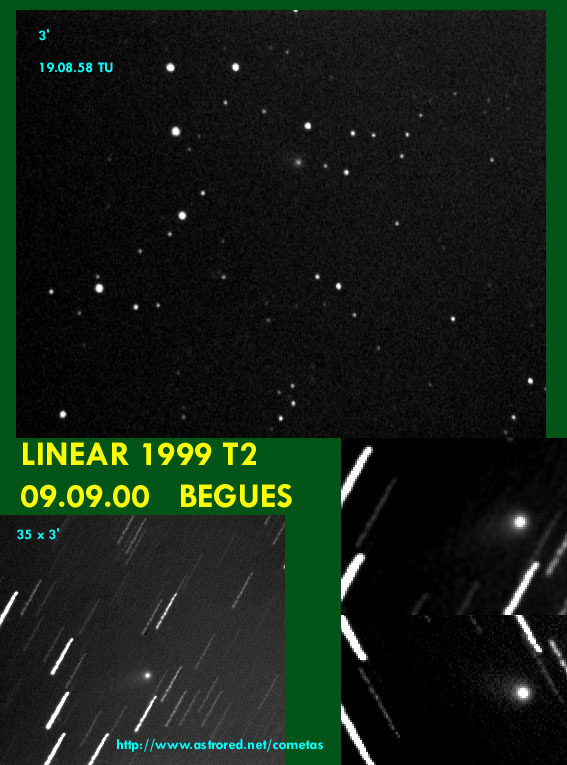 1999 T3 LINEAR Linkage at the Minor Planet Center of observations by LINEAR on several nights during October 3.34 - 21 revealed an 18th mag object with a nearly-parabolic retrograde orbit. This orbit also represented a single-night detection of an object by E. W. Elst and S. Ipatov at Uccle on Oct. 18. Following placement of an ephemeris on The NEO Confirmation Page further observations were made on Oct. 24 and 25. In response to enquiries, Elst remarked that the object was diffuse and had a possible tail to the north; J. Ticha and M. Tichy, Klet, reported the object as slightly more diffuse than stars of comparable brightness and deduced a coma size of 9"; and D. Durig, Sewanee, TN, in poor conditions (strong wind, full moon), also noted the object's diffuse appearance. [IAUC 7289, 1999 October 25]. The comet is a distant one and will not get any brighter. Observations in ICQ format, last observation 1999 November 5, updated 1999 November 29. A/1999 TD10 Details of a distant asteroid discovered by Spacewatch on October 3.19 were announced on MPEC 1999-T46 [1999 October 11], with further observations and a new orbit given on MPEC 1999-V07 [1999 November 2]. The 19th magnitude centaur asteroid is in an unusual high eccentricity orbit and was discovered when near perihelion at 12.3 AU. A revised orbit was published on MPEC 2000-O36. It is in a 1020 year orbit with a semimajor axis of 101 AU. 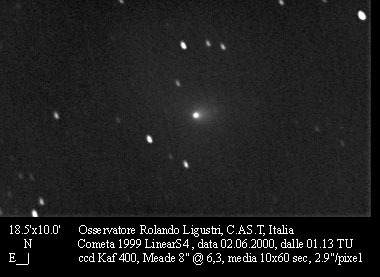 1999 U1 Ferris LONEOS (0.59-m Schmidt + CCD) reported the discovery of a 17th mag comet on October 18.38. Additional observations were reported following posting on the NEO Confirmation Page [IAUC 7283, 1999 October 18]. The comet was at perihelion last year and will fade. Observations in ICQ format, last observation 1999 November 8, updated 1999 November 29. 1999 U2 SOHO Doug A. Biesecker, SM&A Corporation and Goddard Space Flight Center, reported observations of a comet (not a Kreutz sungrazer) discovered independently by S. Gregory (Stanford University) and by J. D. Shanklin (Comet Section, British Astronomical Association) in SOHO/LASCO C3 data. The comet is very faint, and not visible in very many frames. It was first visible on October 25.21 and remained visible until October 25.74. [IAUC 7292 and MPEC 1999-U29, 1999 October 28] I made the co-discovery on October 26.35. 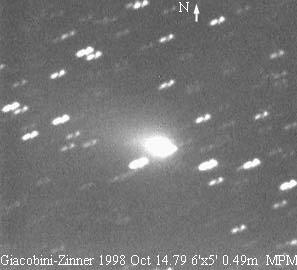 1999 U3 P/LINEAR R. Huber reported the discovery by LINEAR of an 18th mag comet on October 30.32. Additional observations were reported following posting on the NEO Confirmation Page [IAUC 7295, 1999 October 31]. It is past perihelion and will fade from 16th mag. 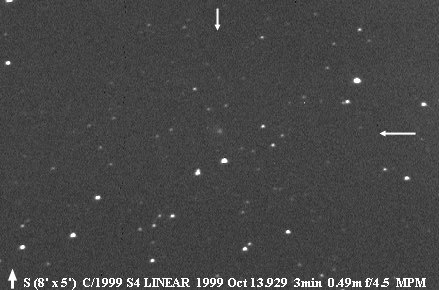 1999 U4 Catalina-Skiff On October 31 T. B. Spahr, Lunar and Planetary Laboratory, reported the discovery by the Catalina Sky Survey on October 31.25 of a slow-moving 17th mag object that was independently discovered on November 1.28 by B. A. Skiff (measurer B. W. Koehn) of the LONEOS survey. In response to Skiff's alert, R. L. Millis and L. H. Wasserman, on a 5-min R-band exposure with the Perkins 1.8-m reflector, detected a coma extending 8" southeastward from the nucleus. After a posting in The NEO Confirmation Page, M. Tichy and Z. Moravec, Klet, also reported that the object had an 8" coma [IAUC 7298, 1999 November 1]. 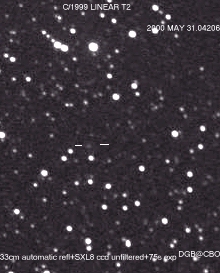 The object is very distant, but should be visible until mid 2002, fading from 13th mag. 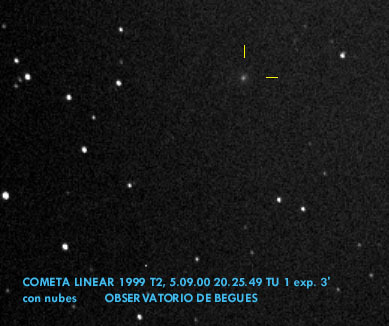 Pepe Manteca imaged the comet on August 25. Observations in ICQ format, last observation 2002 May 17 24, updated 2002 October 1. A/1999 UG5 Details of another unusual asteroid, discovered by the Catalina sky survey on October 29.25, were given on MPEC 1999-V09 [1999 November 3]. This 18th magnitude object has a perihelion distance of 6.6 AU and a period of 65 years. 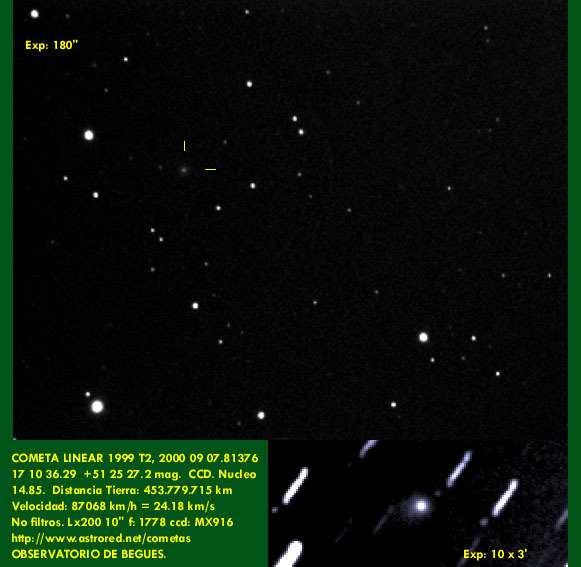 1999 V1 Catalina C. W. Hergenrother, Lunar and Planetary Laboratory, reported the discovery of another comet of 18th magnitude by the Catalina Sky Survey on November 5.44. [IAUC 7302, 1999 November 7] The comet is close to perihelion and in a distant orbit. It will remain at a similar brightness until early next year, then fade. P/1999 X1 Hug-Bell Amateurs Gary Hug and Graham E. Bell, Eskridge, KS, reported their discovery of a 19th mag comet on December 10.33, showing a faint tail in p.a. 285 deg on CCD images taken with a 0.3-m Schmidt-Cassegrain reflector during the course of their minor planet search and follow up program. Following posting on the NEO Confirmation Page, L. Sarounova (Ondrejov, 0.65-m reflector) obtained observations on Dec. 11.2 UT showing a tail 20" long in p.a. about 300 deg. C. Hergenrother, Lunar and Planetary Laboratory, reports that a co-added 1200-s R-band image obtained with the 1.54-m Kuiper telescope on Dec. 11 shows a 15" coma and a slightly curved tail > 1' long in p.a. 280 deg. All of the available astrometry (including prediscovery observations on Oct. 10 and Dec. 7 by LINEAR) gives elliptical orbital elements, with perihelion in June and a perihelion distance of 1.9 AU. [IAUC 7331, 1999 December 11]. The comet will fade. A/1999 XS35 Details of another unusual asteroid, discovered by the LONEOS program on December 2.42, were given on MPEC 1999-X19 [1999 December 9]. This 17th magnitude object has a perihelion distance of 0.95 AU and a period of 79 years. The orbit approaches very close to the Earth at the ascending node, so the object is classed as a PHA. The orbit passes only 0.008 AU from the Earth and the asteroid passed this point only 2.9 days ahead of the Earth. If it produced a meteor shower, slow meteors would have been seen by Southern Hemisphere observers on or around November 11.1, with a radiant point of RA 17h 55m, Dec -70. Next year the shower would be expected around November 10.3. 1999 XS87 P/LINEAR An object that was assumed to be asteroidal was found by LINEAR on 1999 December 7.38 and 8, and it was later linked to observations by LINEAR on 2000 January 6 and 7 by G. V. Williams, Minor Planet Center. Following a request from the Minor Planet Center after seeing that the orbit appeared cometlike, M. Tichy and Z. Moravec obtained observations at Klet on January 11 and 12 that showed this object to be diffuse with a coma diameter of 15". [IAUC 7344, 2000 January 12] The comet is in a long period orbit (73 years) and was at perihelion in 1999 August at 2.8 AU. Observations in ICQ format, last observation 2000 January 15, updated 2000 January 29. 1999 Y1 LINEAR A 17th mag object with unusual motion and reported as asteroidal by LINEAR on December 20.22 was found to be cometary in appearance following posting on the NEO Confirmation Page. Z. Moravec, Klet, reported that the object appeared slightly diffuse with a possible coma of diameter about 10" on images taken in poor seeing on Dec. 21 and 22. G. Billings, Calgary, AB, reported an apparent nebulosity of diameter about 12" on Dec. 23 CCD images taken with a 0.36-m reflector, and he noted a faint tail about 20" long in p.a. 70 deg on Dec. 27. S. Nakano, Sumoto, Japan, reported that H. Abe (Yatsuka, 0.26-m reflector) found the comet to be evidently diffuse, T. Kojima (Chiyoda, 0.25-m reflector) found a 10" coma and a short tail toward the northeast, and T. Oribe (Saji Observatory, 1.03-m reflector) found a 20" coma and a 30" tail in p.a. 60 deg, all on Dec. 27. A. Nakamura, Kuma, Japan, found coma diameter 0'.35 and a faint tail in p.a. 60 deg on Dec. 27 (0.60-m reflector). The initial orbit is parabolic with perihelion in March 2001. 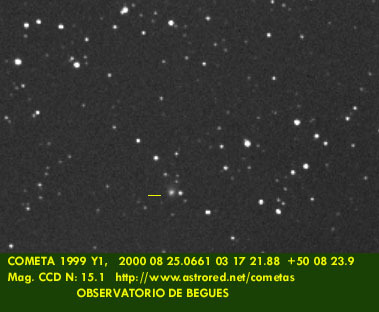 [IAUC 7338, 1999 December 27] Pepe Manteca imaged the comet on August 10, August 18, August 25. By the end of 2001 the comet was fainter than 14th magnitude. Observations in ICQ format, last observation 2002 January 25, updated 2002 October 1. 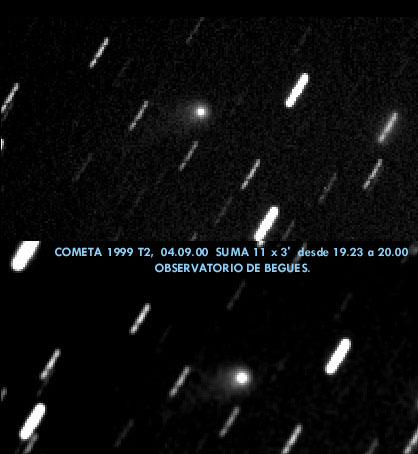 1999 Y2 SOHO Kazimieras Cernis, Vilnius, Lithuania, discovered an apparent comet at magnitude about 5 on SOHO images taken on 1999 December 28.28 that were posted on the SOHO website. D. A. Biesecker, SM&A Corporation and Goddard Space Flight Center, reported that the comet was visible on both LASCO C2 and C3 images and that no tail was detected. Astrometric measurments by Biesecker and D. Hammer (University of Maryland), reduced by Marsden, appeared on MPEC 2000-A36, together with parabolic orbital elements (q = 0.048 AU, i = 111.4 deg), showing that the comet is not a Kreutz sungrazer. Magnitude reductions by Biesecker and Hammer show that the comet faded from mag 6.1 to 6.8 during Dec. 28.58-28.79, and thence from view while still in the C3 field. [IAUC 7343, 2000 January 10]. The comet should have still been brightening at this point, implying that its volatiles had probably been exhausted. It is possible that it might be imaged by CCD, though the elongation and altitude are poor. Kazimieras provided the following information about the discovery: I discovered this comet due to your two discoveries and information which helped me for looking at CCD images. The object at C2 was difficult for detecting at 1024x1024 too. I say that because I detected independently SOHO-94 with a bright tail after A. Vourlidas without problem on December 21. C/1999 Y2 was without tail and its brightness was similar to Sgr24 in orange filter (about 5 mag). Then I discovered SOHO-95 at C3 images (from December 27 23 hours) and sent more than 20 positions to B. Marsden. D. Biesecker did not reply me for 6 days. It was a holidays. If the comet has absolute magnitude about 18, it could be detectable with CCD in the our evening sky as 15.5 mag with elongation about 40 deg these days before bright moonlight coming.